Mayzee, Doubledoodle out of Dee sired by Max, with Michael P.
“I was watching another Goldendoodle litter from another breeder and they didn't give any information on the puppies other than to sell them. Watching and learning how you two were caring for your dogs as well as the puppies is why I chose to purchase from you! So seeing you put so much effort and care into your dogs and puppies I just knew Mayzee would be an amazing addition to our family....and she sure is! We love her so much! 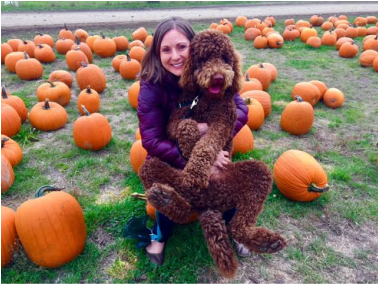 !” – Amanda P.
I would like to take this opportunity to calm any potential hesitation you may have in the purchase of a puppy from Laurelwood Doodles. When my husband and I purchased a new home in June of 2015 I immediately began the search for a reputable breeder in the Portland area. I came across Laurelwood Doodles online and saw that they had available puppies. I decided I would go to their home and check them out for myself. It was immediately apparent that they care deeply for their dogs and puppies. I spent a good amount of time with Georgann and Ralph speaking with them about their process with the dogs as well as observing the behavior of the animals at their home. They explained to me the biosensor training and how it would impact the dog's demeanor. I didn't know anything about this at the time, but I 100% believe in it now. Full disclosure: this next bit is biased because I truly believe Farley to be the best dog ever and I also attribute that in part to the care that he received during his time with these great people. Our amazing dog, Farley is just over a year old now and he has completely surpassed all expectations of what a smart, loving & hilarious companion should be. He has been the most well behaved dog from day 1. He has one of the sweetest personalities I have seen in any dog. He loves to be around people and is great with kids and other dogs. Potty training was a breeze, he took right to his crate and continues to be easily trained. I simply can't say enough about what a wonderful addition to our family he has been. I would be happy to speak to anyone considering purchasing a puppy from Laurelwood Doodles! Laurelwood doodles asked me to send you a review because you are thinking of getting a pup from them. 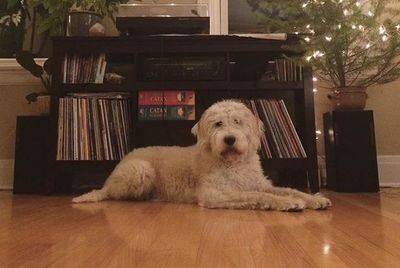 My husband and I got our male Goldendoodle from them last August and we couldn't love him more. ​Right off the bat we felt very lucky because he never had accidents in the house and to this day he has never chewed on a single thing apart from his toys. I'm not sure how they do it, but ours turned out to be the most loving cuddle bug. He's not a barker or a jumper and listens very well, and he is adorable and amazing with little kids so we can't wait to start a family. I've attached several pictures and you can feel free to follow me on Instagram- jessiann1030 to see video clips of our Coconut. Feel free to ask me any questions as well. I looked at so many breeders before setting on Laurelwood doodles, they give their dogs so much love and attention right from the start and it really shows. "My boyfriend and I adopted a little boy doodle born to Max and Dee, who we named Bodhi. I can't speak to how wonderful our adoption experience and overall experience with our puppy has been. Bodhi is calm, thoughtful, affectionate, energetic and aware. We take him to Powell Vets and our vet Katy Felton refers to him as 'the gentleman,' because he's always so polite and easy going when we went in for puppy shots and regular check ups. 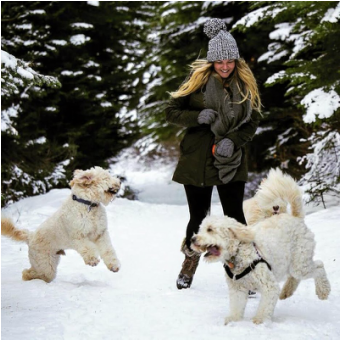 ​"We have one of Laurelwood’s adorable Goldendoodles! 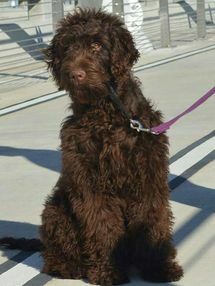 We have little Micah who is a chocolate doodle. We couldn’t have asked for a more precious addition to our family. He has a wonderful temperament, is amazing with small children, behaves well, responds well to training, and of course, sleeps a lot! He has a loud bark—which makes me feel protected, but a kind and gentle spirit about him. ​He’s what I would call a “happy dog” and sprinkles happiness wherever we go. I’m a child therapist and am in the process of training him to be an Animal Assisted Therapy dog. 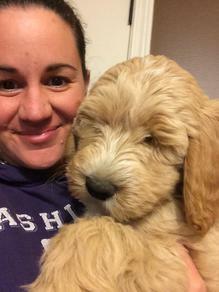 ​"I welcomed three doodle puppies into my home over two months, each from a different breeder. 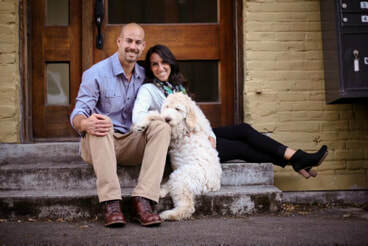 All three had the wonderful, goofy, social temperament of the breed, but I did notice the pup I got from Laurelwood Doodles had a few advantages due to the incredible care and biosensor training she received before entering my home. All three of the pups were well socialized, however, only the pup I purchased from Laurelwood Doodles was able to easily transition at night in the crate. She fell asleep with ease whereas the other two were stressed and cried at night. ​"He is a handsome looking dog! What don’t we like about Pirlo? He’s honestly the perfect dog. He’s the most loving, friendly, sweet, loyal, compassionate. smartest, puppy ever. He is great with kids—loves playing with my little nephews. Sounds like Farley has very similar characteristics. Also, Pirlo doesn’t bark (unless he hears someone near our house), it took us one week to get him potty trained, never has accidents in the house, has never destroyed any furniture, etc. His emotions are so human-like It’s crazy. ​Update: "I had another raving review from our groomer who told me how good Piper was today. In fact Zephyr had to have Pi tethered to the grooming near him so he'd stay calm. "Totally calm and not fussy with detailed work" This is a testament to Laurelwood Doodle's hands on work and biosensor training." Arlo, Doubledoodle, out of Dee, sired by Max beloved by Susan H.
"We made it through our first 4th with Arlo. He wasn't phased by the fireworks at all. I think we have you guys to thank for this among all the other wonderful things about this guy. He is so calm and loving. Not to mention gorgeous. Thank you! "- Susan H.
Harley, Goldendoodle, out of Mocha sired by Max. "Harley is the light of our life! Easy tempered, easily trained and quite the love bug! We couldn’t have asked for a better addition to our family Thank you Laurelwood Doodles!!" -Ysela B.